A range of products used to create level flooring systems on balconies and roof decks that allow pavings to be suspended and water to run away to prevent ponding and a build up of dirt and debris between slabs. 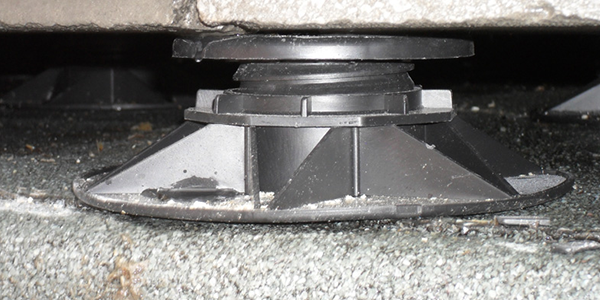 Integral spacers create a joint between paving units and the hight can be easily adjusted using the threaded core. The product is available flat in 12mm to 25mm that can be stackable and adjustable up to 600mm height. All the supports have lugs to ensure a secure seating fixing for the paving or with various profiles to accommodate decking. Accessories include shims to counteract undulations in the roof surface and any minor variations in the slab thick ness and adjusting key. When using Promenade Slabs a decision will have to be made as to how you will lay the slabs at edges. Where an upstanding edge exists it is possible to slab all the way to the edge with cut slabs or avoid cutting any slabs and fill in the gaps with pebbles or similar. If you decide to fill the gaps the you should refer to “a guide for laying promenade tiles”, or please click here “A guide to laying promenade slabs”. Where an open edge exists at handrails etc. It is important to avoid any chance that slabs may move forward and off the edge the under load from pedestrians, wind and vibration.